In 1603, Champlain made his first of many voyages across the Atlantic to the St. Lawrence Valley. His role as a geographer, explorer, cartographer and observer for the king was external to the voyage’s chain of command. This voyage was funded by Aymar de Chaste together with investors from Dieppe, Rouen and Saint-Malo in France, and was commanded by Captain François Gravé, Sieur du Pont, or Pont Gravé. 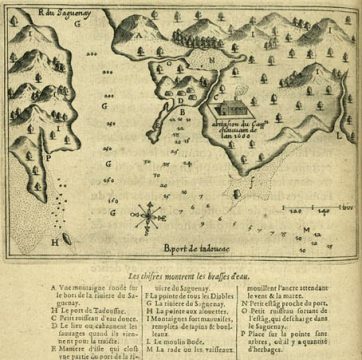 Two young Montagnais (Innu) men, who had travelled to France the year before to learn French and study the culture, accompanied Champlain and Pont Gravé on this voyage aboard the Bonne-Renommée, which left France on March 15, 1603, and arrived at Tadoussac on May 26. One of Champlain’s key priorities while at Tadoussac was to establish good relations with the Aboriginal peoples in the region. When he arrived, a large assembly of many nations was gathered at today’s Pointe aux Alouettes to celebrate a victory over their common enemy, the Iroquois (Haudenosaunee). Among them were several nations of Montagnais (Innu) (Innu) and many Algonquin (Anishinabe) nations from the Ottawa River area to the far northwest. Champlain, Pont Gravé and their Montagnais (Innu) (Innu) companions sailed across the Saguenay River and entered the camp where they were immediately taken to Chief Anadabijou. During this meeting, one of the Montagnais (Innu) men just back from France spoke of his experiences in that country and with the French people. 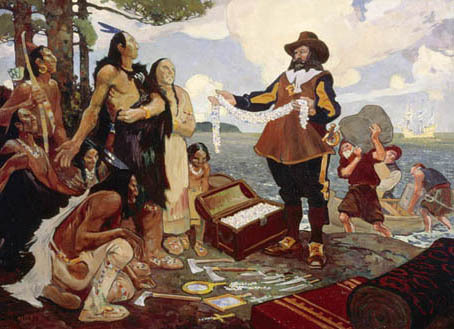 This gathering, and the subsequent “tabagie,” or celebration, at Tadoussac provided the French and the Aboriginal nations present with an opportunity to forge an alliance based on trade and mutual interests. Champlain’s other priorities in 1603 involved exploring possible trade routes and potential sites for permanent settlement. He surveyed the lower Saguenay River as a possible trade artery and trade route to the northwest passage. To protect their own interests as middlemen in a lucrative fur trade, his Montagnais (Innu) allies prevented him from travelling up the river to its source. They did, however, share knowledge and general information about the country beyond the lower Saguenay River, including the Great Lakes and Niagara Falls to the west, and a salt sea to the north. 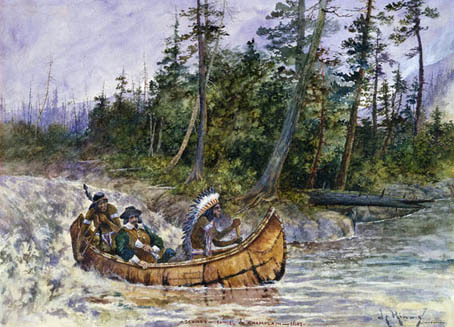 Much of the remainder of Champlain’s journey was spent travelling the St. Lawrence to Montreal Island and the Richelieu River to the Saint-Ours Rapids. During his time on the St. Lawrence in 1603, Champlain named Montmorency Falls after the admiral of France and Trois-Rivières at the mouth of the Saint-Maurice River. He then sailed beyond Tadoussac to the Gaspé Peninsula, where he speculated on Acadia’s mining opportunities and a possible shortcut to China. The Bonne-Renommé arrived back in France in late September 1603. In November of that year, Champlain published a book on his journey, titled Des Sauvages, ou Voyage de Samuel de Champlain, De Brouage. This and future accounts of his voyages communicated to the king and influential members of French society the great potential of New France for trade and settlement.